Ehkzu Artzu: Vikings on the History Channel--true or false? 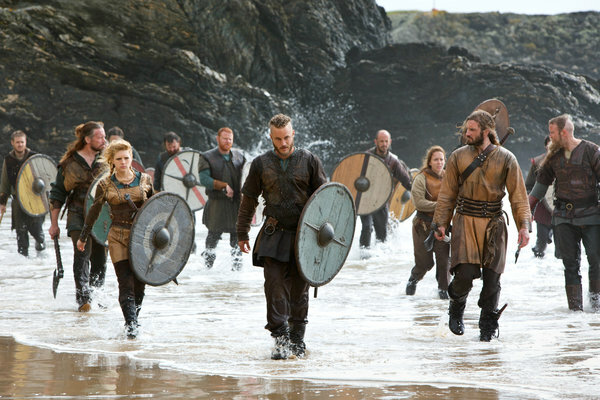 Vikings on the History Channel--true or false? Both the article and the comments illuminate a philosophical dialog between science's Lumpers and Splitters. As should be obvious, Splitters obsess about the differences between things, Lumpers about the similarities. The article's author is making a Lumper argument. As a Lumper myself. I'd ask the Splitters here: what difference do the differences make? To me what would be the most problematic would be if the behavior of the Vikings in the show differed considerably from that of the real deal. So for example in the sword & sandals Hollywood epics of the 50s, the women all wore modern hairdos and acted like 50s American women--to the point of laughability. I don't see anything so anachronistic here. The biggest question to me is the shield maiden thing. I don't see absolute proof one way or another, though I'm a bit doubtful about them going raiding. At the same time the protagonist Ragnar is presented as a radical innovator, and his wife as well. So if anyone were going to kick over the traces it would be them. Also, Christian mores had not yet come to Viking country, and it's conceivable to me that the extreme strictures imposed on women by Medieval Christian culture were not found in the earlier Viking culture. I agree with the author of the article that there is an overall tipping point with docudramas, beyond which the show becomes unwatchable to anyone with a scientific background--even for us Lumpers. All the Chariots of the Gods nonsense, for example. I submit that this show is far, far from such a tipping point. And on the level of human motivations, a chieftan hanging on to his power by all means fair or foul isn't just plausible--it's a given. Ditto the ways in which a tribe's smartest warrior could be pushed to take on the Big Dog. Where I really get off the boat is when the Dickensian coincidences pile up, the motivations look like thin excuses to get us to the next fight scene or special effects event, or look like the screenwriters are just stirring the pot for the sake of stirring the pot. Or everyone's voice sounds like one person's voice. I find none of that here, so on the level of personal character-driven drama I find Vikings believable. So I find myself in agreement with the NYTimes article about the series.